Just over a year after Skype’s first announcement of SkypeKit as a closed beta program for third party developers, Jonathan Christensen, Skype’s Vice President, Emerging Opportunities, announced the opening up of the SkypeKit developer program to a public beta at eComm 2011 this afternoon. Yesterday I had the opportunity to discuss the program with Chris Andrews, Sr. Business Development Manager at Skype. The primary function of SkypeKit is to provide access to a “headless” version of Skype from which developers can provide their Skype functionality through their own product’s user interface. Otherwise SkypeKit provides access to the same functionality as standard desktop clients; however, it does not support screen sharing or multi-party video (Group Video). To join the SkypeKit developer program developers create a developer account and pay a one-time fee of $10 to download the SDK and participate in the developer community forum. With its ability to support embedded Skype in hardware, hardware partners will also need to obtain Skype certification at the standard costs for that program. Software application developers have no additional cost. At this point there is no revenue sharing expected by Skype; that’s the one issue that will have to be addressed at some point if Skype is to demonstrate ROI to Microsoft. Chris confirmed access to the video stream is available via Skype’s proprietary RTP interface which has been designed to address the various screen formats developers will encounter with either their own hardware or, in the case of a software application, the various PC and other intelligent device displays. 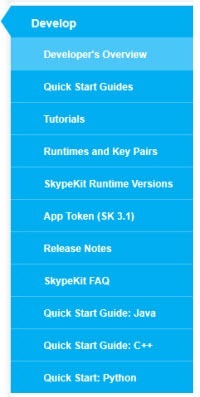 Documentation is available at the Skype Developer site. While SkypeKit provides support for both hardware and software, most of the development to date has centred around hardware devices. At CES Skype announced that SkypeKit was being used for a baby monitor based on the Panda chip and is being tested for incorporation into GM’s OnStar service. One new player he mentioned is Tely Labs, a startup with no website, who are developing a “living room experience” for their own branded TV accessory; we’ll have to wait to see what this means beyond the various Skype for TV/BluRay offerings. The biggest benefit of Imvox’s participation in the SkypeKit developer program is it allows us to offer the gaming community crystal clear voice quality, which is used by hundreds of millions of people across the world every day. The Skype partnership also enables Imvox to work cross-platform, so Windows and Mac users enjoy the same high-quality audio. It’s about time a solution works for everybody in the gaming market. I had an opportunity to experience Skype’s SILK codec in a gaming platform a year ago November with the launch of the Blabbelon “click-to-talk” voice service for gamers. It’s a different market space from the traditional consumer and business voice conferencing. Long time Skype partner InnerPass has been awaiting the launch of SkypeKit’s open beta to incorporate Skype into their newly launched Group Mix team collaboration service – an evolution of their previous InnerPass Meeting and Sharing service that was offered as a Skype Extra. The SkypeKit Developer Site provides documentation and samples to assist with the development process covering topics such as TV, audio and video and various development tools. However, Chris did mention that, while all the tools are there to support software development, they still need some work to make a software developer totally comfortable with using SkypeKit. Bottom line: With Skype’s pending acquisition by Microsoft it will be interesting to see what uptake there is from developers and how this developer program works in conjunction with other Microsoft developer programs. Certainly Microsoft brings the financial heft and experience required to establish and attract a large developer community for SkypeKit as it evolves. According to Stacey Higginbotham’s GigaOm discussion with Jonathan Christensen there are 2,000 developers who have been part of the closed program but there are over 10,000 developers who have applied and can now participate. As with the iPad and smartphone market spaces the evolution of the real time communications space will really depend on how readily users will adopt the resulting applications. Until other services can offer a combination of high quality voice, the ability to call a wide range of devices and platforms, HD video and over 170 million active users, Skype certainly starts out with an initial performance lead over pending competitors. Skype Journal: Skype for iPad; SkypeKit launching at eComm next week?